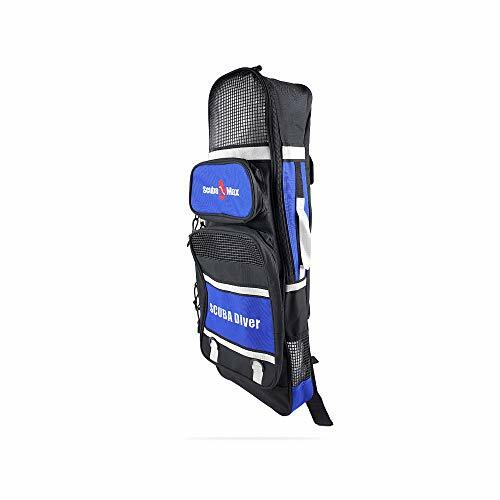 ScubaMax Snorkeling and Diving Gear Bag >> dimensions: 29.5" x 11" x 7"
There are a lot of good options out there if you’re looking for a diving backpack. Unfortunately, a lot of these options feature a high price tag, without offering much in the way of added features beyond their cheaper competitors. 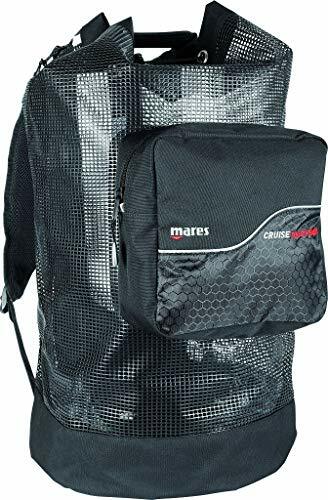 The Mares Cruise Mesh Backpack Deluxe offers a nice middle ground between more expensive brands that will run you in the hundreds of dollars, and cheaper alternatives that may fall apart halfway through your dive. STYLE: The bag comes in a nice, understated black color that is eye-catching without being distracting. The simple mesh design allows for high level performance without compromising its look. The stitching and lines are all well constructed. The red details on the zipper and on the front logo make the bag stand out and give what is mostly a fairly utilitarian design a bit of flair. The bag has a slim profile that keeps it from looking bulky. PERFORMANCE: The bag is supposed to do it all, both carrying your gear as you travel to the dive site and serving you once you’re there. And, for the most part, that’s exactly what it does. The mesh design makes the bag lightweight and great for travel to remote dive sites. Though light, the bag is sturdy and has a good carrying capacity, meaning you won’t have to leave any gear you need at home. As a dive bag, performance on the boat and at the site is important. Water drains easily through the mesh, meaning the bag won’t get water logged and slow you down. A lateral zipper provides a great deal of access when you’re in the water. It was easy to unzip and pull something out in a hurry. The bag dries off quickly once you come out of the water or if it gets sprayed, so it won’t stay wet for days after a dive, and is ready for travel soon after you’re done with your dive. When you do travel, the shoulder straps are padded and comfortable, keeping the bag in place on your back and the gear from shifting around. Even if the bag is full and weighed down, the straps distribute the weight well across your shoulders and back, not straining any one area too much. In tests, the bag was still comfortable over long hikes with heavy loads. Adjusting the straps can be a bit difficult, but not to the point where it becomes frustrating. STORAGE: The front zip pocket is a bit small for some gear, but will work to carry any extra gear you may need, such as a regulator or a computer. The mesh is flexible enough that a lot of oddly shaped gear can be shoved into the bag and moved around to make room for all you’ll need. Since the main area of the bag is one large compartment, large pieces of gear will fit without any major issues. The drawstring top makes it easy to seal the bag quickly and open it up just as fast. It keeps gear in place, and the strings did not wear out with use. In tests, the bag was able to hold all the gear needed for a dive, without having to pack things in too tight. Gear felt well supported and did not shift around too much during travel or on the boat. BUILD: The bag is quite light, but through hours of testing it held up well. The stitching all stayed in place, and there was no fraying. Color did not fade after hours in the sun. The materials appear to all be of a high quality and quite durable. PRICING: Here, the Mares Cruise mesh backpack really stands out from all other dive backpacks. The bag retails for a price that is rare for a full-feature dive bag. A lot of divers pay hundreds of dollars for a bag with similar specifications. This one is much more affordable. If you are in need of a Snorkel Gear Bag that is cheap, simple, breathable and durable? Look no more. This bag is so simple and easy you won't even know what to do with it... except it's for your snorkel gear and so much more! The bag is 18 inches wide and 30 inches tall so it can fit all of your gear including snorkel, mask, fins, and even a towel and dry clothes. It doesn't stop there though. This bag is great for everything from other beach equipment such as Frisbees, lunches, great for extra storage on your boat. It really does have endless possibilities. The bag comes in four colors and is not a full mesh. At the bottom of the bag it has a nylon finish to keep sand and water out of your car and house and you can properly clean the bag after once you get home. The mesh at the top of the bag allows for air circulation so your gear won't get moldy and you will have your equipment last longer. It has a draw string at the top with a quick release button so you don't have to worry about losing any of your items from the bag, but you can open it in a pinch to get in the water faster. If you are looking for something a little more heavy duty and you travel a lot, this is the bag for you! This bag is specifically designed to hold mask, fins, and snorkel and because it is a little bigger you will be able to put your snorkel boots or socks. The overall size is 30" height x 11.5" Width x 7.5" diameter. So whether you have long or short fins they will fit (double check the size of you fins length first, Just in case), up to 29" fins will work. Even though it says it only holds one set, I have been able to fit two sets in no problem. The heavy duty PVC coated mesh panels allow for drainage and fast drying. There is a single padded shoulder strap so if you do pack quite a bit of equipment in your bag it won't aggravate your shoulder due to the padding. It has a single handle on top and in the front of the bag there is another pocket that is enclosed where you can put valuables or even sunglasses so they won't get scratched. The bag has weaved nylon zip cord so when you do use your towel you can synch it up on the bag so it doesn't keep that wet towel smell in your bag and will dry faster. The ScubaMax Snorkeling and Diving Gear Bag is perfect for that avid travel who needs protection of his or her snorkeling gear. This durable backpack style bag offers 2 straps to wear on the shoulders for easy transport. It has lots of compartments and is lined with an easy clean and protection liner. This bag makes travelling all too easy. The big shape of the bag 29.5" height x 11" width x 7" depth leave you plenty of room for all of your snorkeling equipment and most often 2 sets. All of this room in the bag, yet it is not big and bulky like other sets of equipment bags. It has two external pockets for goggles, glasses, valuables and much more with a heavy duty zipper for durability. There is meshed areas for air ventilation to your equipment so if there is moisture or water still left in the bag it won't go moldy or wreck your equipment. With the protective liner you can open the bag up and wipe it down with soap and water to look good as the first day you bought it. Finally something with some color. This bag is offered in pink, blue or black! It has pockets for everything and keeping your valuables that can't get wet, dry and with the mesh lining in areas it allows for ventilation to dry your wet gear. 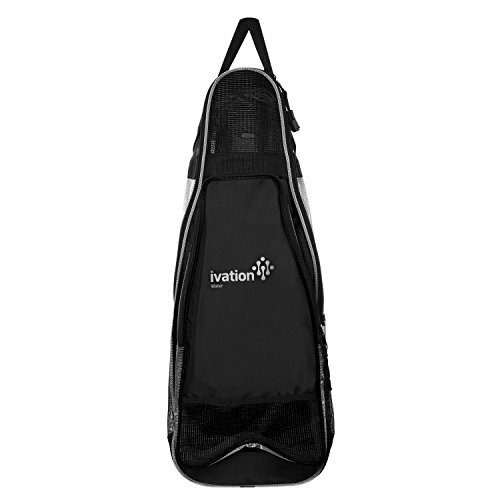 The Ivation light weight snorkel bag has a main component so you can keep your fins, mask and snorkel away from other items and can even fit more in the main compartment and maybe even a second set. It has specific compartments for each snorkel item so it can be safely stowed away without wrecking the other items. The durable bag is made of PVC coated mesh and nylon so it will last for years to come. It has strong zippers that won't break and keep your gear and valuables safe and secure. It will last through transit going through the plane, to the beach and boat tours so your sure to have your equipment at the end of the day. The dual adjustable straps make it easy to throw on your back and head to your next destination. A single carrying handle makes it simple to pick up and move from one spot to another. 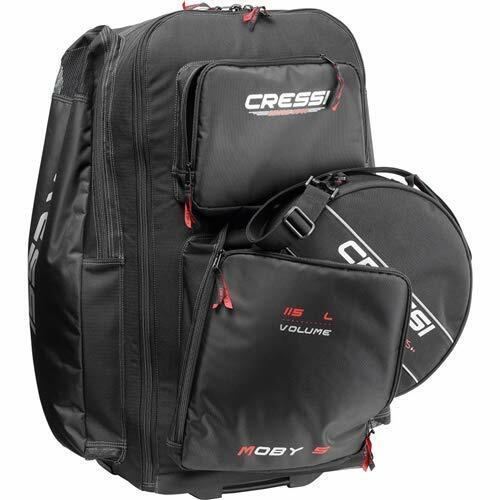 I will start with one of my favorite bags and that is the Cressi Moby 5. There are 5 pockets for everything and more to get you from your cold destination to your warm tropical resort. To start with this bag has wheels (that are removable just in case they break) or you carry it like a backpack instead. An adjustable handle so it is like a suitcase and rolls really easy. Not only that it comes with shoulder straps so you can wear it like a backpack so when you are going over the sand or rocky terrain just throw it over your shoulder and away you go! The bag is made from 300/400 Denier Nylon and is very durable so it will last your long hauled flights all around the world. The pockets include larger ones on the side for your fins and smaller ones for your regulator, hoses, mask, and everything else. YKK zippers are one of the best and which you will find on most Scuba Diving Gear Bags. There are vertical supports to keep it upright and durable enough that not even the package handlers will wreck your equipment. 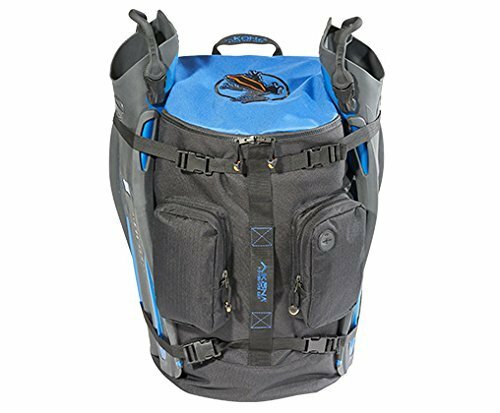 This really is one of the best bags on the market and it only weighs 14 pounds so with your Cressi Light Weight gear you will travel and save money on package fees. 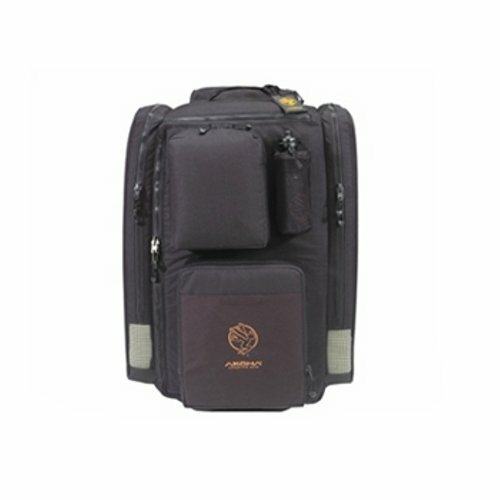 Akona has lots of options for gear bags that works great for travel with all of your Scuba Diving Equipment. 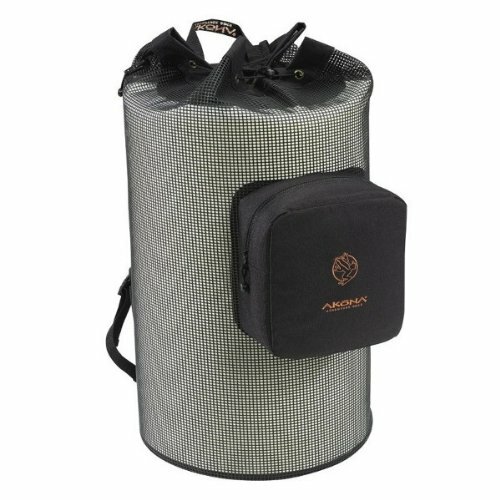 This specific Akona Dive Gear Bag is 12" X 30" X 13" and can easily fit all of your gear in it. The huge selling point is that the material is resistant to stains and mildew. No matter due diligent you are in terms of cleaning the salt and sand out of your gear there always seems to be a little water left and especially if you have long hauls or are travelling quite a bit, it can be tough to take your gear out and let it all dry out. With this Akona you will be better suited for your bag not to get moldy which is fantastic so it keeps your gear and bag cleaner for longer. It is lightweight at 10 pounds and 420 Denier Nylon and 600D polyester accents. It is a sleek blue, grey and black so you will be able to see it coming out of the conveyor belt at the airport regardless of it is Hawaii or Italy. The strong support base and upright supports make it durable and strong for any journey. It has easy rolling wheels and an adjustable handle. This is a great bag for warmer climates. A little tough to get your wetsuit in but if you are going somewhere hot, you have nothing to worry about! Everything will fit tight and snug in the Akona Orange Globetrotter Backpack. A nice design for package especially when you travel. The orange color makes it easy to see no matter where you are and especially on a boat, airport or in the car you know exactly which bag is yours. 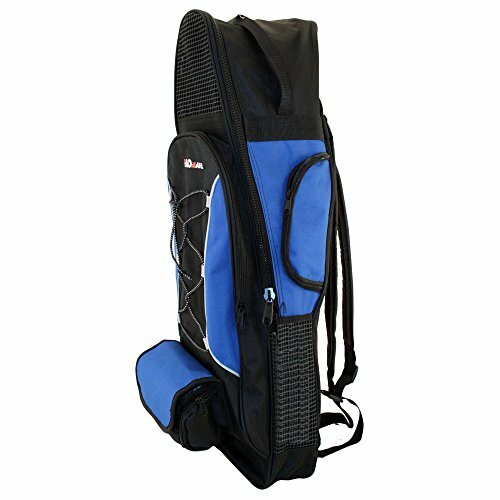 The duffel style bag allows for your fins to strap securely to the outside of the bag and lets them dry out and lessening your chance for moldy flippers later on and the compression straps will work great. A great bag and will last! Another great Akona bag that can actually fit everything and then some. You don’t even need another suitcase unless you have lots of clothes. With a size of 31 x 14 x 21 inches and only weighing 10 pounds it is a great value for your travel needs. The extra space in it makes it easy to travel with only one bag. There are pockets at the size for your fins for space saving and two at the front with a water bottle holder. It makes life easy when you are on the water and not quite sure where the water is coming from especially if it is not in a bottle. This makes it easy to have access to water as soon as you get out of the water. The handles are reinforced with box stitching and a heavy duty bronze zipper with slider and all of them are rust proof which is ideal for being around salt or fresh water. There are mesh paneling which is great for circulation and allows for airflow so your gear does not get moldy. A little bigger goes a long ways and a few extra features make this a fantastic bag for travel. With wheels and an adjustable carrying handle zooming through the airport is easy. Adjustable shoulder straps make it easy on uneven terrain. You cannot lose. 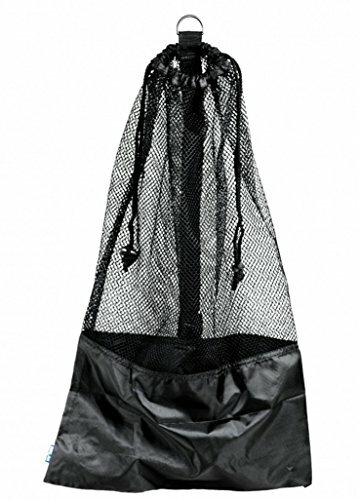 Primarily there are two different types: Mesh Snorkeling bags and regular Snorkel Bags which are primarily made of nylon. Some have the combination of both as well. Then it gets into a variety of compartments and placing of them, along with shoulder strap, and then zipper or nylon drawstring. Let’s start with the mesh bags. They come in a variety of styles such as duffel bags, tote bags, back pack style, 1 strap bags, and single bags with a draw string. With mesh bags it allows for air circulation through the bag so when you have wet gear thrown into the bag it won’t get moldy or stale because it has thorough ventilation. Most mesh bags make it for easy storage because they are so versatile they collapse into pretty much nothing and are very light weight. I will go over the pros and cons for both. They are great for when you are snorkeling on the boat because they take up less space and you can even keep you other belongings in the bag when you are in the water. Even though the mesh provides a breathable surface, they still can keep smaller items safe and makes it so you do not have to worry about losing your belongings through the bag. Not only are they good for just your snorkel gear but are versatile so if you are going to the beach or you decide to do some shopping you can leave your snorkel gear at home and now you have an environmentally friendly bag. This cuts down on smaller costs of grocery bags, in which some stores you have to pay for bags, in which long term you are saving money. It helps on the clutter of unused bags in your house or hotel room with less waste for the garbage dump. Just like with everything there are the good and the bad, however, it all depends on how you look at each bag and what is most important for you. Along with having great ventilation the down side is that if the bag is in your hotel, house, or car the excess water and sand has to go somewhere and that somewhere is where you don’t want it to be. The sand and water is small enough and will drain through the mesh bag. Due to the mesh it is see through unfortunately. This means that if you are at the beach, boat or shopping everyone can see what you have in the bag. So if you have valuables or your unmentionables in the bag, people can see through the bag leaving it more susceptible to theft. Just like with the mesh snorkel bags the nylon snorkel bags come in a variety of shapes suitable for your needs. The positive comes first. With the nylon bags, they are fully enclosed that cover your gear up completely from the public and come with a variety of pockets for your belongings. When you get to your car and home, with the fully enclosed bag you won’t get sand or water everywhere keeping things nice and tidy. You can then clean your equipment off where you want to, so you don’t make a mess of the places that need to be kept clean. Storage! Most nylon bags come with a variety of pockets and openings for your belongings. Some have attachable goggle cases so you don’t scratch or mess up your lenses if you don’t already have a specific carrying case for them. They offer pockets inside for your keys and wallet for extra safety if someone by chance did look through your bag they would be a little harder to find. You will be able to fit your snorkel boots or socks, towel and even sun screen so your hands are free to hold a beverage or even some food after a long snorkel. There are lots of different strap options that come with nylon bags. Some offer zippers and some offer nylon tie strings for easy in and out access. In terms of straps you can get back pack style for both shoulders to keep symmetry. There is also a single strap for across your should, which can sometimes be more comfortable. Even a single handle if you already have a different back pack on. The biggest thing you need to make sure that you do with nylon back pack is make sure your equipment is dry and clean! If you leave dirty equipment in the bag over night or especially longer periods of time, your gear can get mold on it. The nylon may be nice for protection but it can get hot if you are hauling it from beach to beach or even to and from the car. There is no right or wrong and just like with your snorkel gear, it is a matter of preference. What feels comfortable and what specific needs you have for your gear. Most bags will feel the same it just boils down to size, shape and how many pockets you use. I will be reviewing a number of bags and hopefully this will help make up your mind! There are endless reasons why someone might need a snorkel bag and first of all, it makes life easier and we will find the best snorkel gear bag for you! Having your equipment, snorkel, mask, fins and other paraphernalia heading down to the beach it can become very exhausting not only with your own gear but if you have kids or a spouse this is the way to go.